Vanadium catalysts supported on Al(Zr)-MCM-41-type materials were prepared by impregnation. Textural and structural properties, elemental composition and electronic structure were determined by N2 physisorption, small-angle XRD, SEM–EDX and UV–vis DRS, respectively. Al-containing materials showed mostly of Al framework and a small fraction of Al extra-framework species. Zr-containing materials presented almost exclusively small clusters of ZrxOy covering the MCM-41 matrix. Vanadium catalysts, showed the presence of isolated V5+ species and to a lesser extent polymeric chains likely as small crystallites of V2O5. The catalytic results revealed that VAlM30 catalyst, characterized by a Si/Al atomic ratio of 30, was the most active in thiophene hydrodesulfurization, which could be associated to better textural properties and high dispersion of the vanadium species. The demand for crude oil worldwide has generated a reduction of light crude oil reserves and an increase of heavy and extra-heavy crude oils production. The extra-heavy fractions of crude oil are characterized by high contents of compound containing S, N and heavy-metals, such as Ni and V . Sulfur is the most abundant impurity in the crude oil, so that the main aim of a refinery is to produce ultra-clean fuels with low levels of sulfur . The hydrotreating (HDT) processes are extensively used to remove impurities from different streams [1, 2]. The most predominant metal in petroleum is vanadium, which is usually present in the form of porphyrins . During HDT processes, the porphyrins are decomposed and the metal is deposited as a sulfide on the catalyst surface causing its permanent deactivation [1, 4]. Although metal deposits are considered as one of the factors responsible for the catalysts deactivation, some authors have reported that these metal sulfides could act as catalytically active sites in the HDT processes [5, 6]. Therefore, the development of vanadium-based catalysts to carry out HDT reactions is considered to be a research area of great interest. A few studies have been reported on the use of vanadium catalysts in the HDT reactions [7, 8]. However, most of them have focused on the vanadium sulfides on bulk-form or supported over the conventional support, as alumina. Mesoporous molecular sieves, as MCM-41, have been considered as a potential catalytic support in many reactions, including hydrodesulfurization (HDS) reactions [9, 10, 11]. The main advantage of these mesoporous materials is the possibility to obtain high dispersion of the active phase at high loadings because they possess a well-ordered hexagonal array of uniform mesopores and high surface areas [12, 13, 14]. On the other hand, just like in zeolites, the isomorphic substitution of Mx+ ions (x = 3 + or 4 +) in the mesoporous silica frameworks, induces surface acidity [15, 16] by generation of Brönsted type acid sites. The most of them are based on the Al-containing MCM-41-derivatives, which has been used as support for HDT catalysts [17, 18]. Transition metal substituted MCM-41 by, e.g., Zr , Ti  or Nb  have been less studied than Al-containing MCM-41, but have shown some potential applications for hydrotreatment reactions. In the present work, it is reported a facile synthesis and characterization of some vanadium-based catalysts supported on MCM-41, pure and structurally modified with Al and Zr. The catalytic tests on thiophene HDS at atmospheric pressure were also carried out because, to our best knowledge, these metal combinations have not been evaluated in sulfur removal reactions. Tetraethylorthosilicate (TEOS, 98%, Sigma-Aldrich), fumed silica (SiO2, particle size = 0.2–0.3 μm, surface area = 200 ± 35 m2/g, Sigma-Aldrich), tetramethylammonium hydroxide solution (TMAOH, 25% in H2O, Sigma-Aldrich), cetyltrimethylammonium bromide (CTMAB, ≥ 98%, Sigma-Aldrich), sodium hydroxide (NaOH, 98%, Riedel–de Haen), sulfuric acid (H2SO4, ≥ 97.5%, Sigma-Aldrich), aluminum (III) isopropoxide (Al[OCH(CH3)2]3, 98%, Sigma-Aldrich), zirconium (IV) propoxide solution (Zr(OCH2CH2CH3)4, 70% in propanol, Sigma-Aldrich), isopropanol ((CH3)2CHOH, 98%, Sigma-Aldrich), ethanol (CH3CH2OH, 99.8%, Sigma-Aldrich), ammonium metavanadate (NH4VO3, 99%, Sigma-Aldrich) and deionized water were used during support and catalyst preparations. All chemicals were used as received without further purification. Pure siliceous MCM-41 material was synthesized according to a previously published procedure . In a typical experiment, NaOH was dissolved in deionized water and added to fumed SiO2, under magnetic agitation at 70 °C. An aqueous micellar solution was prepared using TMAOH and CTMAB. After that, the NaOH/SiO2 solution was added to the micellar solution and the pH adjusted to 9 with diluted H2SO4. The resulting gel was kept under magnetic agitation for 2 additional hours. The mixture was aged at room temperature for 24 h without stirring, filtered, washed, dried, pulverized and calcined at 550 °C for 8 h. The molar gel composition is shown in Table 1. Al- and Zr-modified MCM-41 supports were prepared using the procedure in the same report . Aluminum (III) isopropoxide or zirconium (IV) propoxide was dispersed in an isopropanol solution at about 70 °C. After that, TEOS was added to a dry ethanol solution. The TEOS solution was added to solution containing Al- or Zr-ions and kept under magnetic stirring during 5 h in reflux. The obtained solution was added dropwise to the micellar solution, as previously described it. The mixture was aged at room temperature for 24 h without stirring, filtered, washed, dried, pulverized and calcined at 550 °C for 8 h. The molar gel composition and nominal Si/M ratios are also shown in Table 1. Supported vanadium catalysts with 5 wt% V were prepared by impregnation using an excess volume of ammonium metavanadate aqueous solution. The obtained suspensions were treated under reduced pressure using rotary-evaporation equipment at 60 °C and 60 rpm until complete solvent removal. The solid was dried at room temperature and calcined at 500 °C for 4 h.
The supports were denoted as M (MCM-41), AlMx (Al-MCM-41x, where x = Si/Al = 70 or 30) and ZrMy (Zr-MCM-41y, where y = Si/Zr = 40 or 20), while the catalysts were denoted as VM, VAlMx and VZrMy, where the V-containing catalysts presented a V nominal content of 5 wt%. The textural analysis was carried out using a Micromeritics-ASAP 2010 automatic analyzer at liquid N2 temperature. The solids were previously degassed overnight under vacuum at 60 °C. The micrographs and elemental composition were obtained using a scanning electron microscope model FEI Quanta 250 coupled to an energy-dispersive X-ray analyzer EDAX model Octane SDD. Small-angle X-ray diffraction (SA-XRD) patterns were obtained using a Siemens D5005 diffractometer with CuKα radiation and step rate of 0.025°/s. Ultraviolet–visible diffuse reflectance spectra (UV–vis DRS) were recorded using a Perkin Elmer Lambda 35 spectrophotometer. The measurements were done using BaSO4 as standard. The thiophene HDS reactions were carried out in a fixed-bed Pyrex® reactor with 250 mg of catalyst at 350 °C, atmospheric pressure and a volumetric flow of 100 mL/min (2.27 mol % thiophene in H2). Prior to reaction, the mesoporous catalysts were activated in situ under a flow of 100 mL/min (1.00 vol. % CS2 in H2) for 2 h at 350 °C. The reaction products were analyzed using a gas chromatograph equipped with a FID, with sampling of the gas effluent for analysis at 12 min intervals. The stabilization (or steady state catalytic activities) was obtained when four consecutive measurements gave the same conversion (~ 2 h). The catalytic activity is reported as pseudo-first-order rate constant for thiophene disappearance in units of milimoles of thiophene converted to products per gram of catalyst per minute. Generally, the reproducibility was better than 10%. Nitrogen physisorption isotherms of the synthesized supports are presented in Fig. 1. The isotherm of pure silica MCM-41 corresponds to a Type-IV isotherm with a well-defined step at a relative pressure between 0.3 and 0.4, demonstrating the formation of a uniform mesoporous material. On the other hand, the isotherms of the modified supports were similar to that of the parent MCM-41, indicating that a mesoporous structure was obtained after Al- and Zr-incorporation. The modified supports also presented smaller overall amount of adsorbed N2 and an additional Type-H3 hysteresis loop. This can be ascribed to the increase in the materials’ density due to structural incorporation of metal species. Furthermore, the existence of such a hysteresis loop might indicate that some structural defects are formed in the hexagonal channels matrix. The N2 physisorption isotherms of their respective mesoporous catalysts presented similar forms (not shown). The supports showed high specific surface areas; these values are close to or slightly higher than 1000 m2/g (see Table 2). 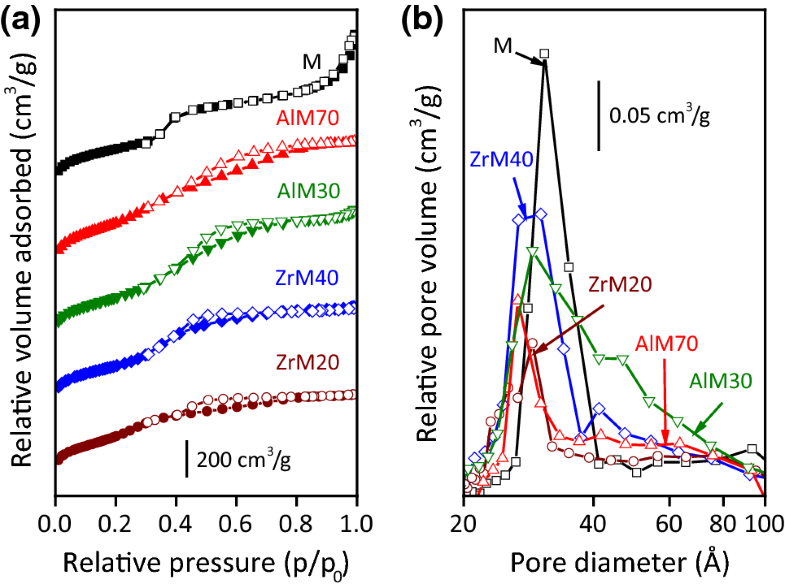 Vanadium impregnation resulted in a decrease of specific surface area and a decrease of pore volume, which becomes more pronounced in materials containing zirconium. These results suggest the presence of some metal species covering the structure of the MCM-41 that can cause pore plugging. On the other hand, the MCM-41 showed a narrow distribution of pore sizes, indicating uniformity in the size of pores (Fig. 1b). The modified supports presented a bimodal distribution of pore sizes, with pore sizes prevailing around 30 Å. According to the literature, these results show that there is a decrease in the hexagonal-type mesopores arrays density, due to the development of a new family of extra-structural pores of size above 40 Å, which can be generated by the presence of small metal oxide crystals dispersed in the matrix of MCM-41 . The textural properties of the mesoporous catalysts are also shown in Table 2. A significant decrease in the specific surface area and pore volume were also observed. This decrease could be due to pore blocking by metal species plus a dilution effect of the support by the supported species [9, 10]. The supported vanadium catalysts with lower Si/M ratios showed better textural properties compared to higher Si/M ones. These tendencies could be indicative that the dispersion of vanadium species was favored on modified supports with lower Si/M ratios. The chemical compositions (Table 2), presented as Si/M atomic ratios (M = Al or Zr), of selected mesoporous supports were obtained by SEM–EDX. SEM micrographs and their respective EDX spectra for the AlM70 and ZrM20 supports showed some spherical particles that are formed by Si, O and Al (or Zr), as it is shown in top and bottom of Fig. 2a and b, respectively. It was also found that the experimental Si/Zr ratios are close to the nominal values. On the contrary, such closeness was not observed for Al modified-supports. The differences observed can be associated to the solubility of the precursors; the Zr-precursor is more soluble than the Al one, suggesting that some Al atoms could precipitate on the support surface forming Al rich-aggregates. On the other hand, the modified supports, prepared from TEOS in alcoholic medium, showed spherical morphology, while the MCM-41 obtained from fumed silica resulted in irregularly shaped particles (not shown). Thus, it can be said that the silica spheres are obtained from the hydrolysis of tetraalkoxysilanes in a mixture of low-boiling alcohols, as previously reported . The well-ordered mesoporous structure of MCM-41 was also confirmed from its SA-XRD pattern (Fig. 3). The unmodified support exhibited a relatively intense reflection at 2.3°(2θ) and two weaker signals between 3 and 5°(2θ) assigned, respectively, to (100), (110) and (200) planes, characteristic of a hexagonal structure [12, 13]. The Al- and Zr-incorporation produced a decrease of the intensity of (100) plane and an incomplete disappearance of (110)- and (200)-reflections. These results can be attributed to distortions in the hexagonal structure due to the isomorphic substitution of Si atoms by Al (or Zr) ones. It can be also seen a shift of (100)-reflection towards lower 2θ values for the Al-modified supports, indicating an expansion of the structure, confirmed by the increment of pore wall thickness, lattice parameter and interplanar distance, as it can be seen in Table 2. Several authors have reported that the increased wall thickness is a strong evidence of metal incorporation into the MCM-41 framework [17, 18, 24]. On the contrary, Zr-containing materials showed a different behavior; the (100)-reflection was shifted to higher 2θ values with increasing Zr content. It was also observed a decrease of the structural parameters, in the material with higher Zr content. These results could indicate that at low Si/Zr ratios, Zr atoms prefer to form extra-framework type species instead of replacing the Si atoms; the UV–vis DRS results confirm it (see below). According to the results, it can be inferred that there are different Si/M ratios to obtain materials with optimal parameters, which has been related to thermal stability of these materials . 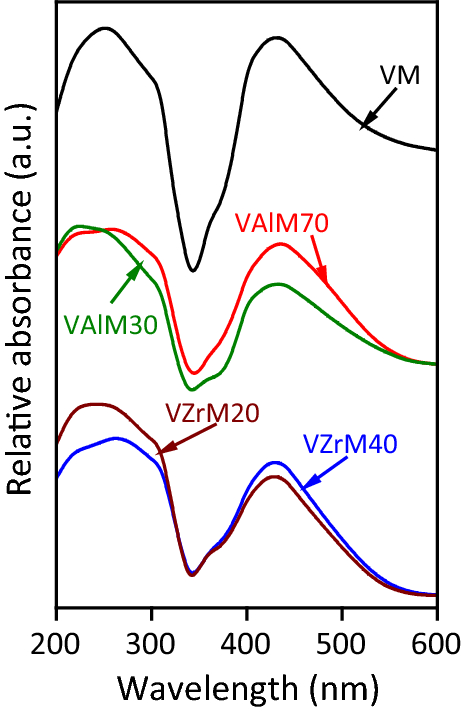 UV–vis DRS is a sensitive technique to study metal coordination, for Al- and Zr-incorporated in zeolites or MCM-41 structures [26, 27, 28] or supported vanadium catalysts [29, 30]. The DR spectra of Al-containing samples presented an intense band at 240 nm (not shown), which increases with Al-content and can be attributed to ligand–metal charge transfer (LMCT) O2− to Al3+ in Al atoms with tetrahedral coordination. However, some authors have also reported that Al-framework species can be characterized by the presence of a band at 220 nm . 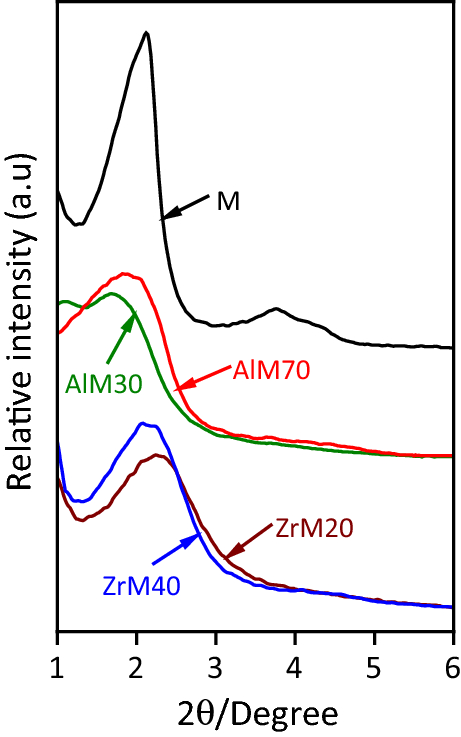 It is possible that the broad band at 240 nm in the spectra involves both Al framework and other types of aluminum species with different states of coordination. It was also observed a small contribution of Al atoms with octahedral coordination by a low intensity broad band centered at 280 nm , formed by surface metal migration. On the other hand, Zr-containing samples presented a single band at 240 nm, which increases with Zr content. Some researchers have suggested that LMCT around 220 nm are probably due to the presence of tetrahedral Zr(IV) species [31, 32, 33]. The adsorption bands above 240 nm have been assigned to the LMCT O2− to Zr4+, with Zr in low coordination state, either isolated or in small ZrxOy nanoclusters inside the silica framework [31, 34, 35]. The DRS and SA-XRD results confirm the presence of ZrxOy nanoclusters partially covering the modified-support; however, these ZrxOy nanoclusters were not detected by wide angle XRD (WA-XRD, not shown), indicating highly dispersed species. It is well known that V5+ at tetrahedral coordination sites absorbs between 240 and 350 nm, at square pyramidal coordination between 350 and 450 nm and at octahedral coordination between 450 and 600 nm [36, 37]. The broad band centered at 260 nm (Fig. 4) is due to the presence of isolated tetrahedral V5+ species that possess the ability of coordinatively bind to H2O molecules from the atmosphere, resulting in color changes in the solids and broadened bands in the DR spectra ; the widening of this band may also be due to the contribution of the heteroatoms (Al or Zr). Furthermore, it was also observed a broad band centered at 430 nm, which can be assigned to V5+ species with square pyramidal coordination. However, the widening of this band could be indicating the presence of polymeric chains and even small V2O5 crystallites [30, 36]. It should be noted that V2O5 was not detected by WA-XRD (not shown), which means that the VOx species are highly dispersed. The experimental results reflected the presence of different V5+ species which could depend on the nature of the mesoporous supports (see Scheme 1). Small V2O5 nanoclusters could predominate when the V is supported on the unmodified MCM-41 (Scheme 1a), while isolated tetrahedral or polymeric chains of V5+ oxides could be predominating when V is supported on the Al-MCM-41 (Scheme 1b) or Zr-MCM-41 (Scheme 1c), respectively. The catalytic activities in the steady state of the sulfided catalysts are presented in Fig. 5a. In this figure, it can be seen that the sulfided catalyst supported on AlM30 (denoted as VAlM30) exhibited the highest catalytic activity. This behavior may be explained because VAlM30 catalyst showed better textural properties (specific surface area and pore volume) as compared to the other catalysts (see values in Table 2). On the other hand, it is well known that Al-incorporation into MCM-41-framework provides increased number of (and stronger) acid sites, when it is compared with unmodified support, allowing a better dispersion of the V species . It is possible that, in the VAlM30 catalyst, an adequate number of active sites have been generated to disperse efficiently vanadium species, which is reflected in the catalytic performance of this catalyst. The VAlM30 catalyst was analyzed by SEM–EDX after presulfidation (Fig. 2c) and its elemental analysis (bottom Fig. 2c) revealed the presence, as it was expected, of Si, Al and O, as well as V and S, indicating the possible existence of a sulfided phase of vanadium. Although the unsupported catalyst presented V2O5 characteristic signals even after the presulfidation step (result not shown), it also showed an intense signal at 44.1°(2θ) that could be assigned to any one of a family of vanadium sulfides of the VxSy type. The observed diffraction signal indicates that the V-based catalysts, under presulfidation conditions, could become partially sulfurized to VxSy phases, which are probably responsible for the observed catalytic activity. 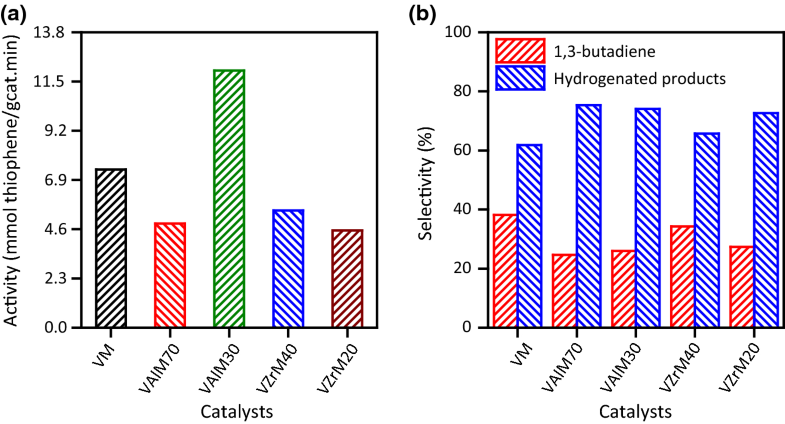 The catalytic activity did not appear to be positively influenced by Zr-modification, as both Zr-modified catalysts showed lower performance than unmodified catalyst, even the VZrM20 catalyst which has shown a high dispersion of V species. This is possibly caused by their low pore volume that can result in pore plugging. It has been reported that the Zr-containing MCM-41 materials have a total acidity comparable to zeolites and, even higher than Al-modified MCM-41 . However, as the Zr4+ ions are unable to incorporate additional hydroxyl groups, those materials have very low acidity of the Brönsted type, which could explain the low catalytic activity. It is probable that the Lewis acid sites are not appropriate to effectively disperse the V species. The thiophene HDS reaction follows two main pathways, as can be seen in Scheme 2 : (1) direct thiophene hydrogenation (denoted as HYD route) leading to tetrahydrothiophene (THT) and, (2) direct C-S scission (denoted as DDS route) to form 1,3-butadiene (BD). Both THT and BD are transient intermediaries that could or could not be present in the final products. 1-butene (BE), cis- (cBE) and trans-2-butene (tBE) are the subsequent products that may eventually be hydrogenated to form butane (BA). The selectivities of all V-based catalysts (Fig. 5b) were expressed as the formation of the DDS product (BD) and the sum of all formed hydrogenated products (BE + cBE + tBE + BA), because the main product of the HYD route (THTH) was not observed. It can be inferred that the evaluated reaction followed exclusively the DDS route. Despite this, it can also be noted that all V-based catalysts showed comparatively high yields of hydrogenated products. Both VAlM70 and VAlM30 catalysts showed lower yield of BD in the final products. These results could be indicative that Al-modified catalysts possess higher hydrogenation capacity compared to unmodified and Zr-modified catalysts. The hydrogenation properties of un-supported vanadium sulfides have already been discussed in the literature . Vanadium sulfides at low H2 pressures promote the DDS route, while under high H2 pressures the HYD route is preferred . 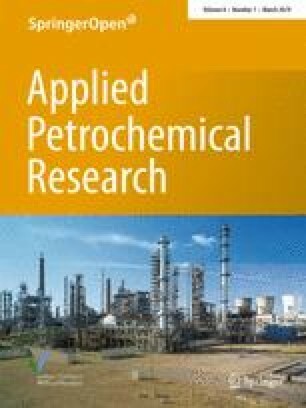 Additional studies are required to fully characterize the acidity properties and better understand the observed catalytic behavior; however, the obtained results showed that vanadium sulfides supported on Al-containing MCM-41 could be evaluated for HDS tests using other model molecules, such as dibenzothiophene (DBT), 4-methyldibenzothiophene (MDBT) and 4,6-dimethyldibenzothiophene (DMDBT), which require a previous hydrogenation of the aromatic ring, followed by the removal of the sulfur atom. 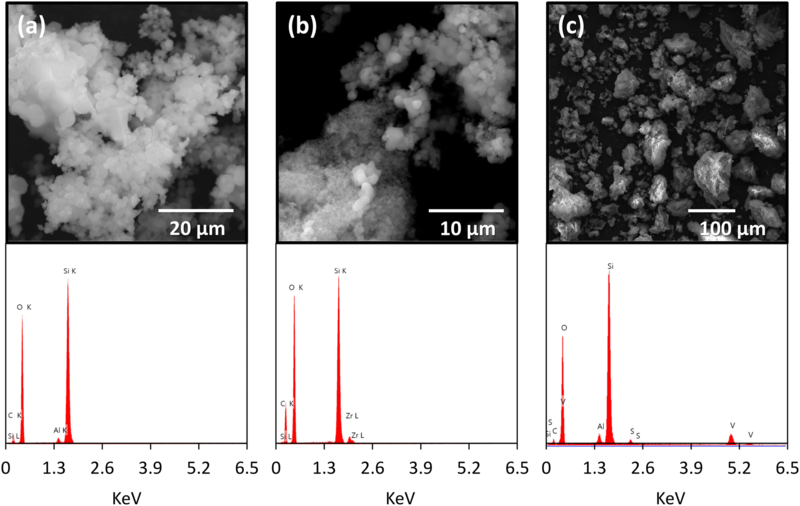 The preparation, characterization and thiophene HDS tests of some vanadium mesoporous catalysts supported on unmodified and Al- or Zr-modified MCM-41 have been presented. All mesoporous supports showed high specific surface areas and well-defined porous structure. Al-containing MCM-41 materials showed mainly Al-framework and a little contribution of Al extra-framework, while Zr modification promoted the formation of ZrxOy type species. Vanadium oxides species supported on modified materials have also been obtained. However, the dispersion of those vanadium species depended of the support nature and was favored on modified supports with lower Si/M ratios. The catalytic test revealed that the VAlM30 catalyst showed highest thiophene conversion that was associated to its good textural and structural properties and the high V dispersion, which in turn leads to a greater dispersion of the sulfided metal species. Aluminosilicates-supported vanadium catalysts showed higher formation of the hydrogenated products. Thus, it is considered that Al-MCM-41-supported V sulfides catalysts could be promising candidates for deep HDS, where it is required new materials with good hydrogenating properties. The authors would like to acknowledge financial support from Fondo Nacional de Ciencia, Tecnología e Innovación (FONACIT) through G-2000001537 project. The authors also thank Laboratorio Nacional de Difracción de Rayos X (LAB-97000821 project) from ULA and Laboratorio de Fotoquímica and Unidad de Microscopía from IVIC for their technical assistances in the SA-XRD, UV–vis DRS and SEM–EDX analysis.